The Sheep Whisperer: Black Friday Blues! 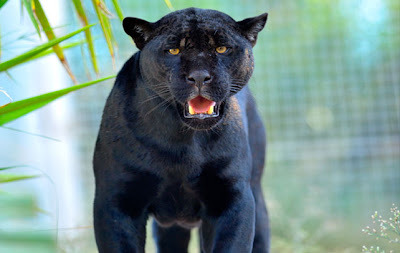 The Black Panther is known as a member of the "Big Cats" family & is native to Africa, Asia, & the Americas. Black Panthers are not a separate species. They are associated together with any black feline of the "Big Cats", in particular, Jaguars, & Leopards. They are all considered to be on the "Endangered" list today because of the increasing decline in their numbers. "Why Grandma,what big teeth ewe have!" 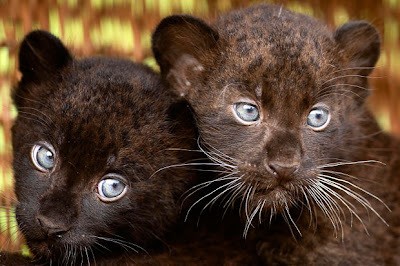 Panthers are elusive & powerful, having emerald green eyes, small heads, & slightly longer hind legs than front. They are routinely dark brown or black in color.The Florida panther is lighter in color, & is an exception to the norm. Panthers are considered to be one of the largest cats in the world, & are among the few cats that roar! Ewe will rarely see me until it's too late! My jaws are more powerful than a locomotive! 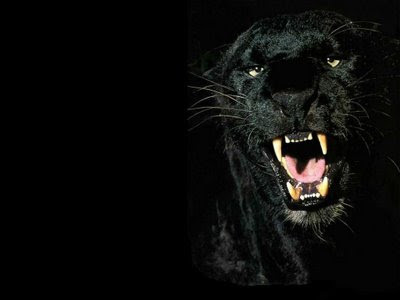 Seldom seen by people, the Panther operates best in the cover of darkness! Nocturnal & solitary, panthers prefer to "shop" for food at night, where they can operate relatively unnoticed! They are known to be excellent climbers, & spend their days resting in trees, on the lookout for unsuspecting prey! Their grocery list includes wart hogs, antelope, wild boars, tapirs, deer, rabbits, & birds. Ewe better listen for my growl, because I'm on the prowl! Agile, cautious, & incredibly intelligent, the Panther is one of the most feared animals of the forest! Panthers possess sharp claws & are able to leap up to 20 feet! They also are able to run up to 40 mph & are not an animal to"tango" with! 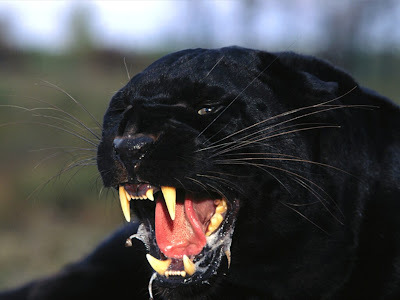 Panthers are aggressively territorial, having little contact with she panthers, except for mating purposes. A mother stays with her 1-4 cubs until they're about 2 yrs.old & able to hunt independently. We are so cute that predators want to just "eat us up" while mom is out to the grocery store! While the strengths of the Panther are noteworthy, sheep avoid the cougar, which is a close relative! 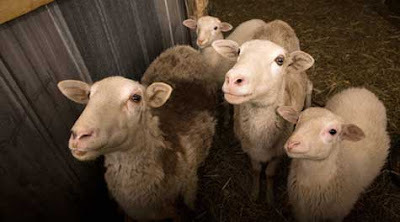 Sheep rely on their keen sense of hearing & smell to avoid being eaten by the cougar! Fortunately, they are not alone in their struggle, but have a reliable Shepherd, who goes to battle on their behalf! Even though we really admire Black Panthers, our Shepherd is still #1! As Ewe engage in Ewe-r day, be aware that Ewe-r enemy is on the prowl, looking for some Black Friday bargains! Look to the Good Shepherd to protect & lead Ewe to His sanctuary of "Best Buys" ! Good word for today! Thank Ewe!! Ewe are very welcome! Be Blessed & Be Aware! God Bless Ewe! "His sanctuary of Best Buys." Thank you for that thought, Chuck. We are indeed safe (having sought sanctuary in Jesus)and blessed (sanctified)when we stay close to and rely on the Shepherd. I'm so glad the Lord encouraged Ewe through the Blog! He is our sanctuary & He's the Best Treasure of all! Thanks for sharing & God Bless Ewe!" "Taste & see that the Lord is Good!" Thanks Rick! I'm glad Ewe liked the Blog & it blessed Ewe! Now that's the kind of shopping to do on Black Friday!God Bless Ewe & thanks for the encouragement!